Northampton Town striker Luke Norris says he is keen to extend his stay with the club on loan from Brentford. Norris, 20, has scored four goals in five starts for the Cobblers but his deal is set to run out next week. He told BBC Radio Northampton: "I'd like to stay. I've spoken to the manager and the clubs will talk. "I've been given a chance here and started every game, which I can only be happy with. I think it's a very good loan move." 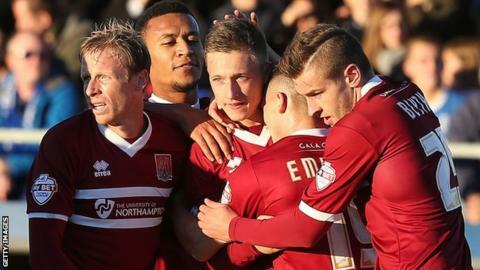 Norris had a number of chances and eventually scored in the 2-1 win over Bishop's Stortford in the FA Cup - Northampton's first victory in six games. "We needed the win today," he said. "It's the first one since I've been here. Hopefully we can take it into our league form. "I didn't think it would go in today and I should've scored a lot more. But I did get one - it was probably the worst of all of them." Norris also accepts that he has to take his chances to impress, as he is in the last year of his contract at Brentford. "I need to earn myself a contract at Brentford, or even Northampton or somewhere else," Norris added. "Playing these games, in League Two, hopefully clubs will take notice."